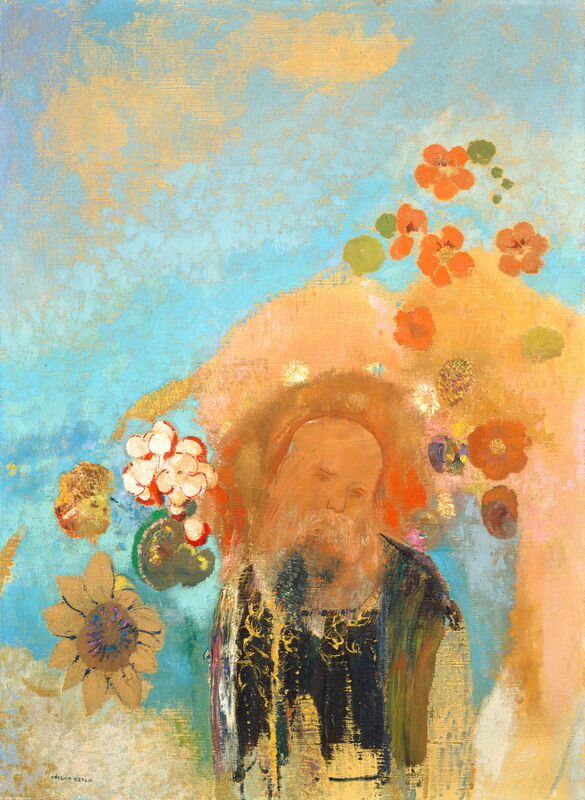 By 1905, Odilon Redon (1840–1916) was one of the most renowned modern artists in France. Although classified a Symbolist, his style was unique and often visionary. Odilon Redon (1840–1916), Woman in a Gothic Arcade, Woman with Flowers (1905), media and dimensions not known, Van Gogh Museum, Amsterdam. Wikimedia Commons. 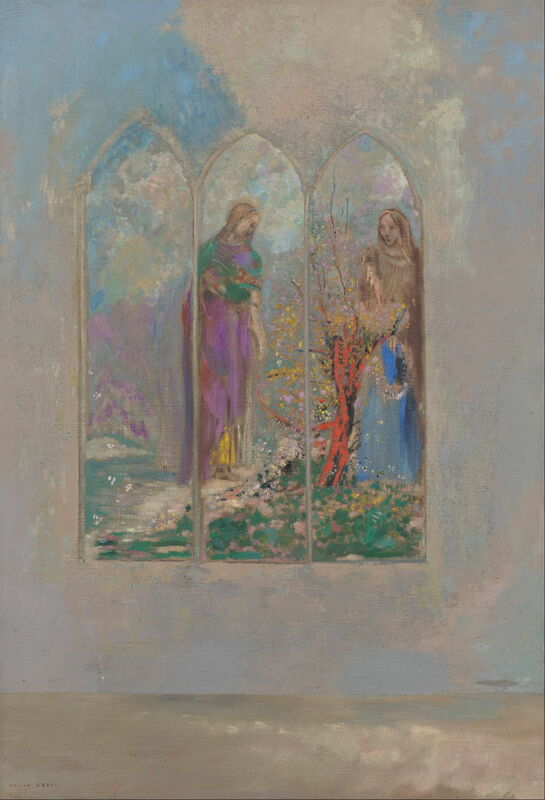 Woman in a Gothic Arcade, Woman with Flowers (1905) combines a framed image of a woman, revisiting the concept of stained glass windows, perhaps, with further floral riches. Odilon Redon (1840–1916), Devotion Near a Red Bush (1905), media and dimensions not known, Van Gogh Museum, Amsterdam. Wikimedia Commons. Devotion Near a Red Bush (1905) is another exploration of an image framed by architecture. His pastel La Voile jaune (The Yellow Sail) (c 1905) is one of his best-known paintings, and follows on with the sailing boat theme from Flower Clouds. It is best-developed here: the small boat with its distinct ochre sail is filled with brilliant, twinkling jewels. Two women sit at its stern, one with her hands on the tiller. The sea is not calm, though, and small waves break by the boat, while the sky is full of scud clouds. 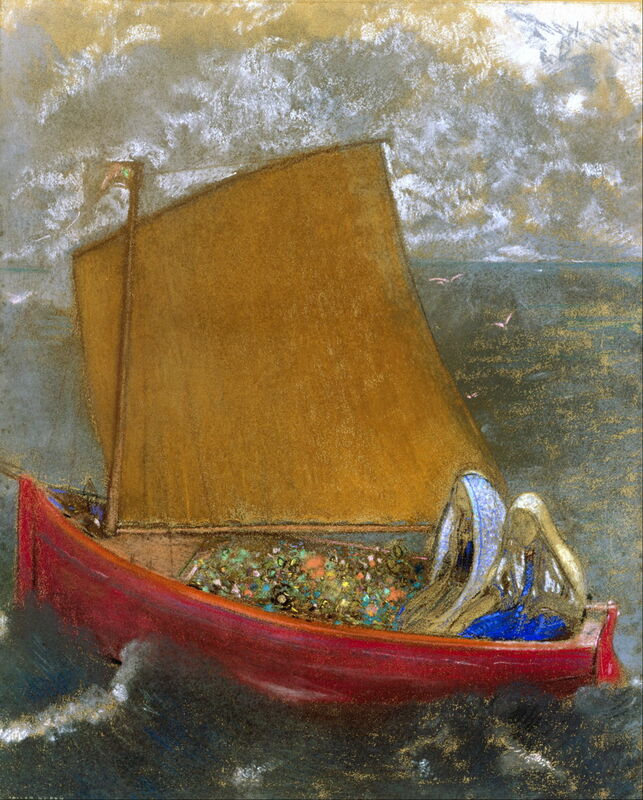 Being almost pure pigment, Redon was able to achieve some remarkable colours with his pastels, as seen here. 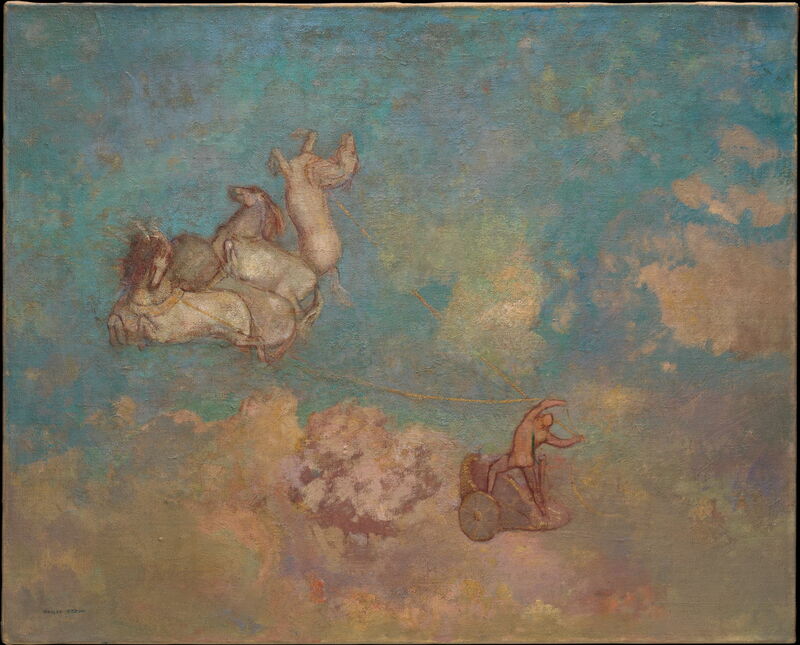 Odilon Redon (1840–1916), The Chariot of Apollo (1905-16), oil on canvas, 66 x 81.3 cm, The Metropolitan Museum of Art (Anonymous Gift, 1927), New York, NY. Courtesy of The Metropolitan Museum of Art. The Chariot of Apollo (1905-16) is an oil painting showing a fragment of classical narrative, that of Apollo the sun god, and the sun-chariot which he drove across the sky each day. From 1905, Redon painted several different versions of Apollo, and his ill-fated son Phaëthon, who lost control of the chariot and had to be struck down to save the world from destruction. 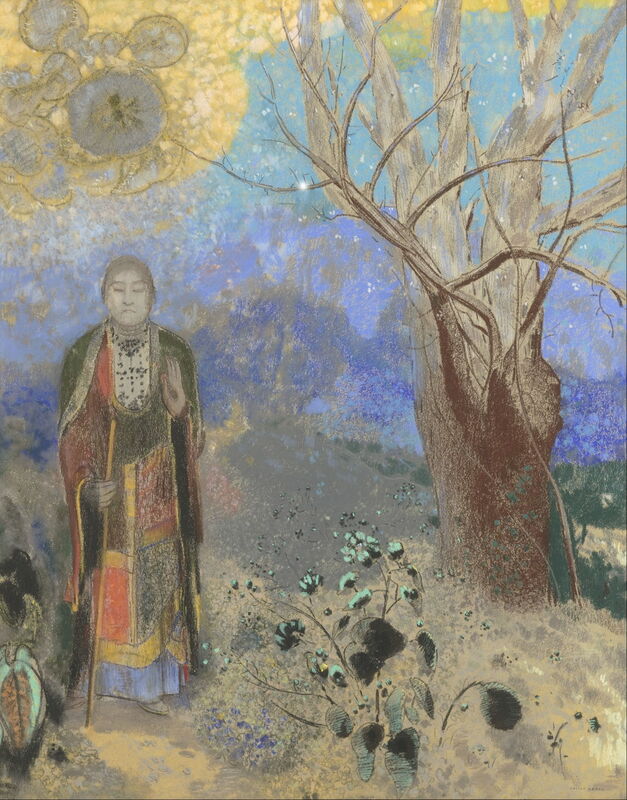 Buddha (1906-7), a wonderful pastel in the Musée d’Orsay, revisits the Buddha theme in its best-known form, with the figure of Buddha now stood near the tree, and a weird collection of plants around them. Odilon Redon (1840–1916), Butterflies (c 1910), oil on canvas, 73.9 x 54.9 cm, The Museum of Modern Art, New York, NY. Wikimedia Commons. It is often claimed that Redon’s paintings became progressively more abstract and less rooted in the real world, in his late career. 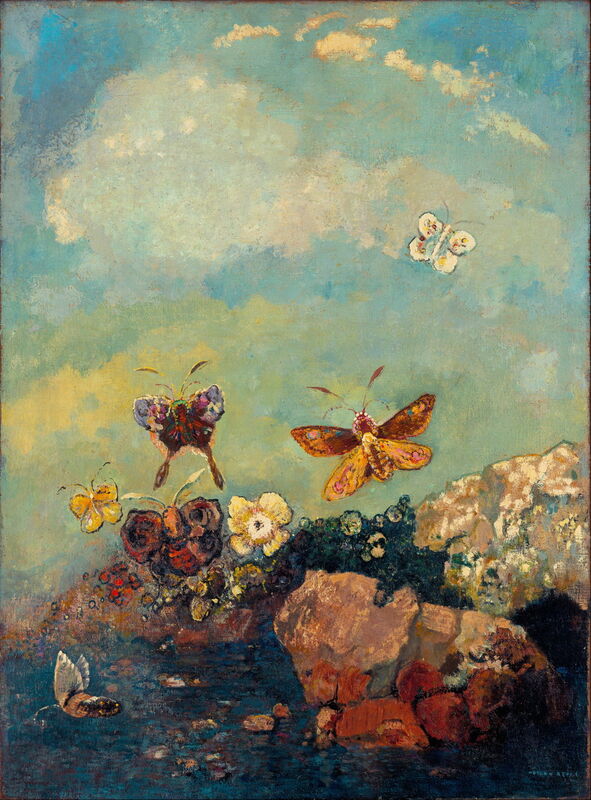 Butterflies, an oil painting from around 1910, shows how his images still retained form, even though their content was so radical. The bizarre butterflies, flowers, plants, and rocks are often outlined to emphasise their form (as with Blake, a reflection of his print-making). In 1910, his paintings were included in the exhibition Manet and the Post-Impressionists, organised by the revered critic Roger Fry in London. Although initial responses were largely of shock, it kickstarted the move to modernism in Britain. 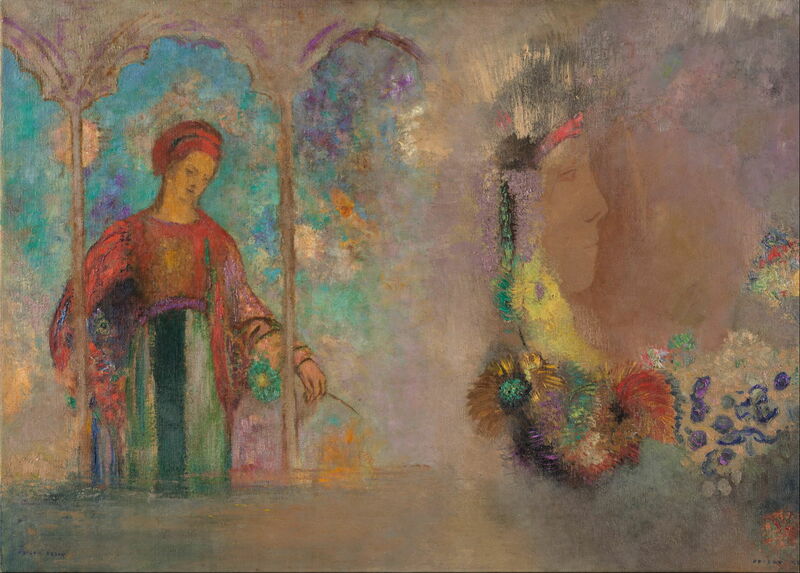 Odilon Redon (1840–1916), Evocation of Roussel (c 1912), oil on canvas, 73 x 54 cm, The National Gallery of Art, Washington, DC. Courtesy of The National Gallery of Art. Evocation of Roussel (c 1912) shows an old, bald man with long hair and a beard, who is hard to identify: most of the Roussels to whom it could refer would have appeared very much younger at the time. Odilon Redon (1840–1916), Two Young Girls among Flowers (1912), oil on canvas, 51.4 x 62.2 cm, Museum of Fine Arts, Houston, TX. Wikimedia Commons. Two Young Girls among Flowers (1912) is not only florally rich, but features a swarm of bees. As is so often the case in Redon’s paintings of figures, both the girls have their eyes closed. 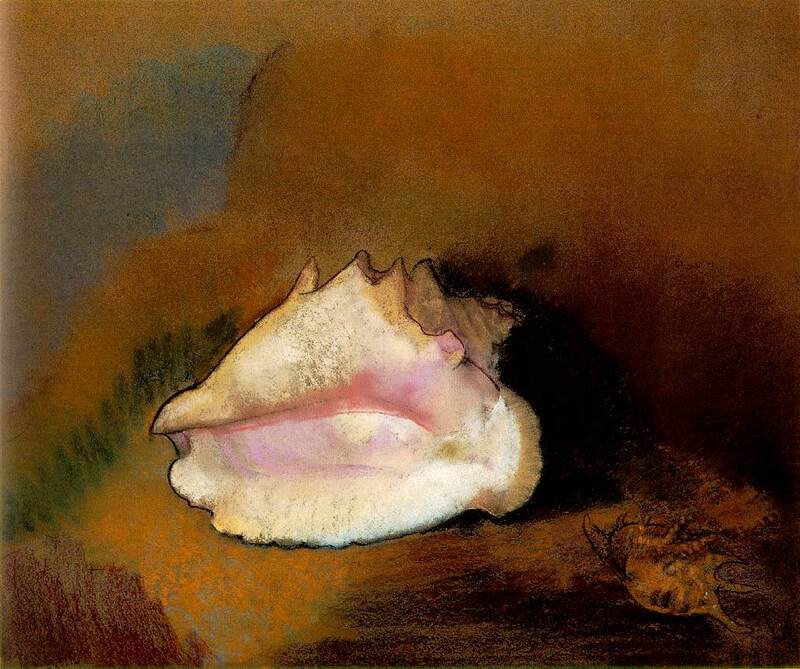 La coquille (The Seashell) (1912) is another exceptional pastel painting, here an aquatic still life. In 1913, Redon’s paintings were included in the large and highly influential exhibition of modern art in New York referred to as the Armory Show, which kickstarted modernism in America. 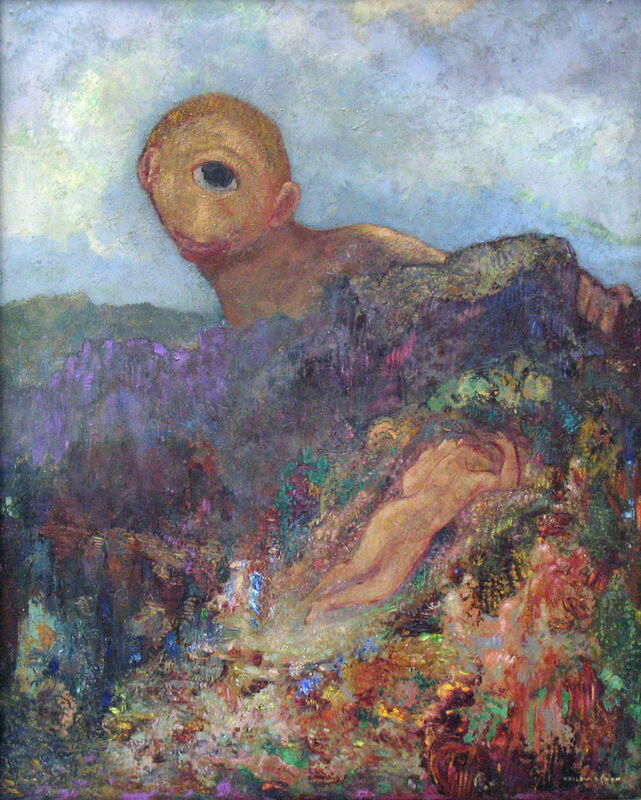 The Cyclops (c 1914) shows a scene from another story of classical legend. Polyphemus, the one-eyed cyclops, is here spying on the naked figure of the Nereid (sea nymph) Galatea. Polyphemus is now better-known from his blinding by Odysseus, but in this story from Ovid’s Metamorphoses he lusts after Galatea, who is in love with Acis. When Polyphemus finds them embracing, he crushes Acis with a boulder, but Galatea responds by changing Acis into an immortal river spirit. Widely recognised as one of the masterpieces of Symbolism, this continues Redon’s recurrent theme of the eye and sight. Odilon Redon (1840–1916), Pandora (date not known), pastel and charcoal on board, 22.1 x 29.1 cm, Museum of Fine Arts, Houston, TX. Wikimedia Commons. Redon’s undated pastel of Pandora is one of a series of works in which he examined this well-known myth, a parallel to Eve and the Fall of Man in Judeo-Christian mythology. Pandora was the first human woman created by the gods, and as punishment for the theft of fire by Prometheus, she was moulded from earth and equipped with seductive gifts. She was provided with a jar (which was later corrupted to become a box) which contained toil, sickness, and diseases. When Pandora was given to Epimetheus as a gift from Zeus, she opened the jar and scattered its contents – ending the ‘golden age’ of mankind. The one item which remained trapped inside the jar was Hope. 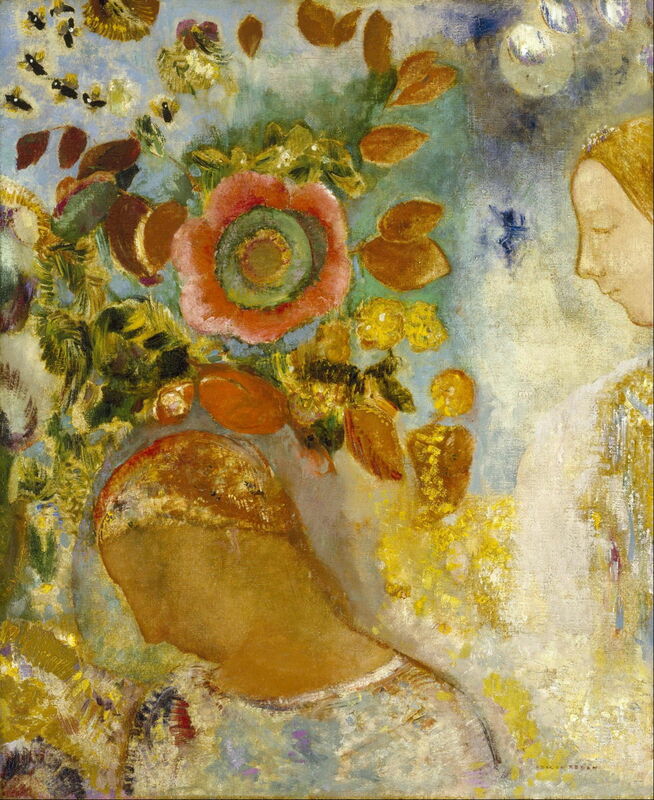 Redon’s pastel painting, now in Houston, shows her clutching the box to her bosom, in a garden full of huge and colourful flowers. 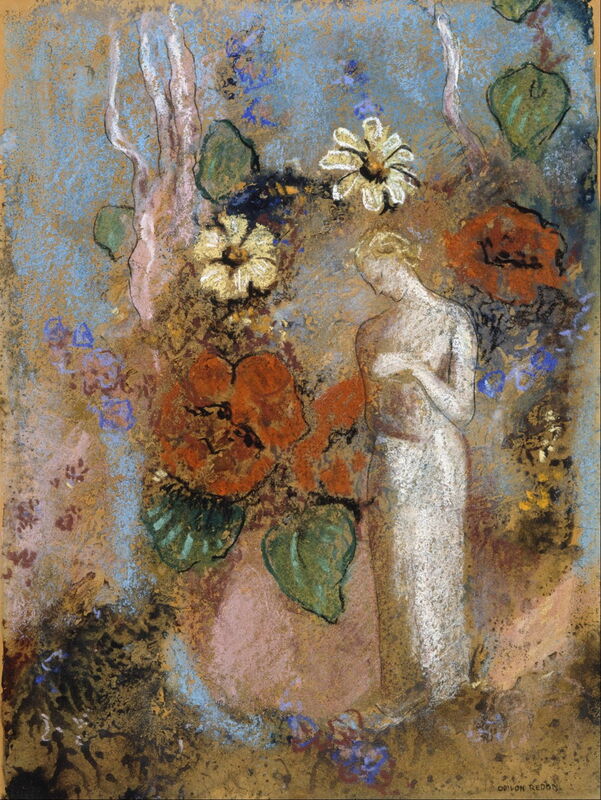 Odilon Redon (1840–1916), Pandora (c 1914), oil on canvas, 143.5 x 62.2 cm, The Metropolitan Museum of Art (Bequest of Alexander M. Bing, 1959), New York, NY. Courtesy of The Metropolitan Museum of Art. The oil painting of Pandora from about 1914, now in the Met, develops this a little further, the flowers shrinking to a more lifelike size, and the box still firmly held to her bosom. Odilon Redon (1840–1916), Evocation (The Head of Christ, or Inspiration from a Mosaic in Ravenna) (date not known), pastel, dimensions not known, Private collection. The Athenaeum. 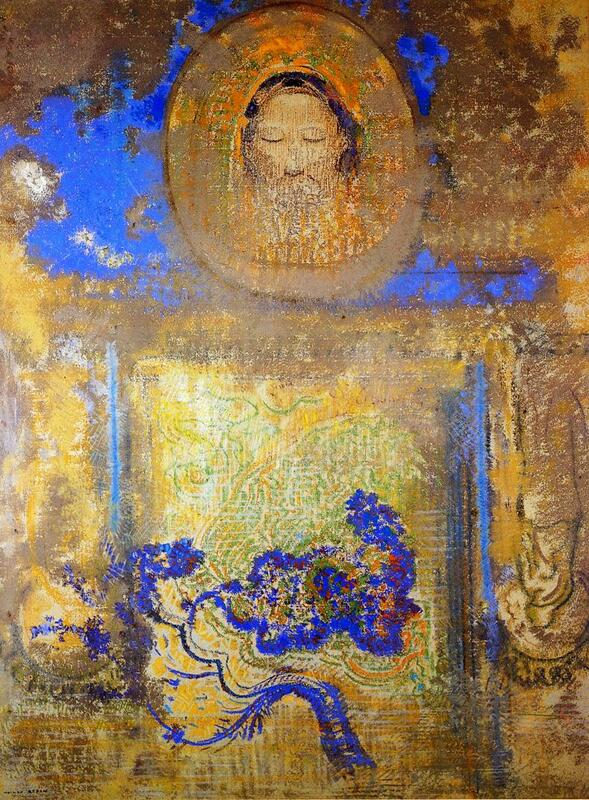 Redon’s undated pastel Evocation, also known as The Head of Christ, or Inspiration from a Mosaic in Ravenna, may well have been inspired by a mosaic which he saw in Ravenna, showing the head of Christ. His eyes are closed, and around him are strangely fascinating forms, painted in brilliant colours – a piercingly blue tree, perhaps, and others which coalesce in the imagination. Odilon Redon died in Paris, in the middle of the First World War, in 1916. Tragically, his innovative art was quickly overshadowed by the moderns. But his images have gone on to inspire other artists of the twentieth century. And, like those of Blake, they will remain radical, fresh, and inspiring. Posted in General, Painting and tagged Impressionism, painting, Post-impressionism, Redon, symbolism. Bookmark the permalink.